Across the District leading up the Election Night results, top Republican and Democratic leaders rallied their parties for a decision that would define their strategies for the next half-decade. 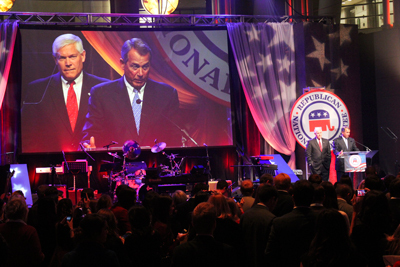 The Republican National Convention official watch party attracted a crowd of more than 3,000. Party crusaders waved American flags and sang along to classics like “Old Time Rock and Roll” and “Life is a Highway” as Fox News’ Election Night coverage blared on a screen behind the stage. Co-chairwoman of the RNC Sharon Day gave a fiery and patriotic speech in the Ronald Reagan building, comparing the 2012 ticket to the conservative icon for whom the building was named. Shortly before 11:30 p.m. when Fox News called the election for Obama, the music died off as the Republican spirit dropped. 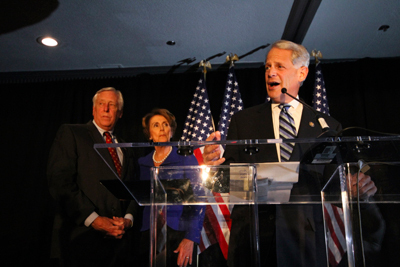 Democratic Congressional Campaign Committee chair Steve Israel addressed an eager Democratic crowd. RNC Chairman Reince Preibus was scheduled to speak about five minutes before Obama was declared the winner, and Preibus never took the stage. The entire ballroom cleared out within half an hour. Cross-town at the Democratic Congressional Campaign Committee party, Democrats chatted to eased their nerves as results trickled in. Young professionals and older party stalwarts congregated around two large televisions, cheering and booing as more polls across the countries closed and projections were announced. After several states had already been called for President Barack Obama, Speaker of the House Minority Leader Nancy Pelosi, D-Calif., took the stage and heightened the Democrat’s fight to preserve the middle class, which she called “the backbone” of democracy. Around the same time at the Republican camp, Speaker of the House John Boehner, R-Ohio, addressed his Republican base. He said if Romney was elected, he would “bring jobs home and let our economy grow,” but stressed that members of Congress needed to focus on bipartisanship over the next four years. “Listen, we stand ready to work with any willing partner, Democrat or Republican or otherwise, who share the commitment to getting those things done,” Boehner said. He praised the House for bipartisan successes, despite criticism from national media. But, in the end, he vowed to fight for limited government oversight. “Our House majority has been the primary line of defense against a government that spends too much, taxes too much and certainly borrows too much,” Boehner said. But as the results began to come in, just one party reacted with jubilance. Republican attendee Thomas Boyer said he retained hope for Romney even after Ohio was called in Obama’s favor, adding that he was worried about the next four years.